Even if you’re landlocked you can still enjoy blackened Mahi Mahi tacos right at home! In fact, you can bring the beach right to your own kitchen with all of our Mahi Mahi Recipes! 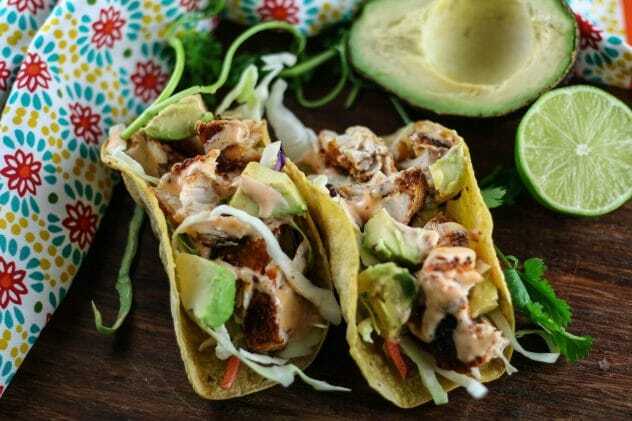 Skip the local cantina tonight and fix these blackened Mahi Mahi tacos! Until I met my husband, trying fish tacos was most likely out of the question. He’s pushed me out of my comfort zone and convinced me to give fish tacos a try. I have to admit, I think my blackened Mahi Mahi tacos might rank up there with the top three fish tacos I’ve ever had! This blackened Mahi Mahi is spicy, yet light and flaky. So. Dang. Good. Where can I buy fresh Mahi Mahi? Living in a landlocked area of the country, purchasing fresh fish can be a challenge. However, thanks to local organic markets it’s getting much easier. I always look for wild-caught Mahi Mahi, which you can usually find at most health/organic grocery stores. Do I need a cast iron skillet to blacken Mahi Mahi? Preferably, yes. Cast iron skillets handle high cooking temperatures much better than nonstick or stainless steel pans. If you don’t have a cast iron skillet available, you can also blacken your Mahi Mahi on the grill. Is Mahi Mahi fishy tasting? No, Mahi Mahi is a very mild white fish with a fairly neutral flavor profile. Are Mahi Mahi tacos gluten-free? Mahi Mahi itself is gluten-free. To ensure a gluten-free meal, I suggest using corn tortillas and make sure your spices are gluten-free as well. To blacken the fish you’ll want to use a cast iron skillet. Add in two tablespoons of avocado oil and heated the cast iron skillet on high. Then, I turn down the heat to medium just before adding the fish. Cook for 6 minutes on one side, then flip and cook for another 6 minutes. The seasonings will blacken but won’t burn. Remove the Mahi Mahi fillets from the skillet, and tear into small chunks. From there you can build your blacked Mahi Mahi fish tacos! 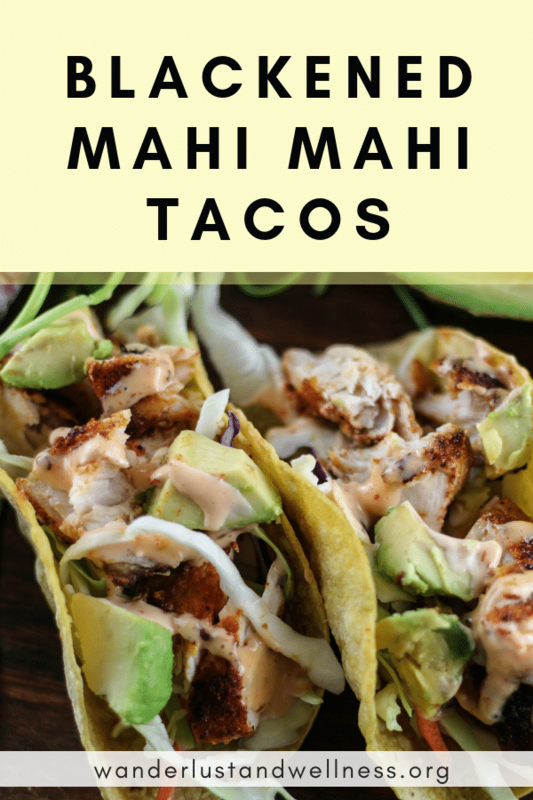 Try these other Mahi Mahi taco recipes! 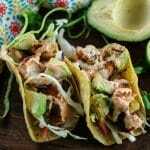 A spicy yet fresh blackened Mahi Mahi taco recipe that you’re sure to enjoy!